General information: Basement bar with restaurant at ground level. Bottles and cocktails, arched nooks for seating. �3.95 for a small bottle of Kingfisher... and then they stick a 60p service charge on top! $4.55! The only good thing about this place is that you get served pretty quick because nobody is buying too many drinks at these prices. Shameless rip-off merchants. Avoid. Yes it does have funky music and it does have tasty drinks, but I stuggle to see how anyone can enjoy themselves with these exoribitant prices. However, if you have more money than sense, and enjoy watching pretentious city types dancing about and being charged about 3 or 4 times the going rate for drinks (plus service charge), then this is the place for you. It's certainly not for me. I wanted to like this place cos I used to live directly opposite - but it was truly awful. Early in the evening it was almost ok in a bland sort of way but by about 9pm it was dreadful. Music too loud to converse, lights too low to see the decor, drinks way too expensive to drink and mysterious service charges emerging out of the gloom. Being overcharged is almost OK if there are compensating factors but here there just aren't any. Rip-off london at its worst. Sadly though, the number and nationality of the drinkers last time I was here indicates that there's money to be made from ripping off foreign tourists. I just hope no locals would ever be foolish enough to come here twice. 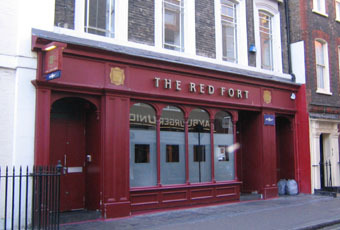 Really sad, since the Red Fort has always been such a great restaurant. Shame they had to sully their good name with such dross. I used to enjoy going to Akbar for a quiet couple of drinks, even then the prices were expensive. Nice atmosphere in winter but these prices are extortionate. Expensive by Soho standards, service charge didn't help though, that said a cool place to relax for an hour or so.